Restoring a 1 percent sales tax on New Orleans hotels would be a step too much for the city’s tourism industry to bear, leading industry representatives said Wednesday (Jan. 30), responding to a new watchdog report that called for the extra tax revenue to help pay for drainage and street improvements. Mayor LaToya Cantrell, who has pushed for the city to get a larger share of hotel sales taxes to bolster underfunded infrastructure, declined to take a position on the report Wednesday. She did, however, signal her intent to work with state lawmakers and tourism industry leaders on a solution, a sentiment Gov. John Bel Edwards’ office appeared to share. But the three largest tourism-focused groups in New Orleans — which get most of the hotel-tax revenue now — spoke out strongly against the bulk of the report’s recommendations. They warned that rededicating any existing revenues could damage local tourism and the economy. The report, released Wednesday by the Bureau of Governmental Research, recommended city and state officials add back a 1 percent hotel sales tax that was shelved in 1966 to make room for state taxes to build the Superdome. Restoring the city tax would raise an estimated $12.3 million for infrastructure and public safety needs, the BGR report said. Echoing past evaluations of the subject, BGR’s latest report said the lion’s share of an estimated $200 million in hotel-tax revenues expected this year will go to the Ernest N. Morial Convention Center and the Louisiana Stadium and Exposition District, which runs the Mercedes-Benz Superdome. Those groups stand to receive $60.5 million and $52.1 million, respectively. By contrast, the city will take only $18.9 million for non-tourism municipal purposes, the report said. To fund a 1 percent increase, BGR’s report said state lawmakers could add a local hotel charge to the general state sales tax the legislature renewed at 0.55 percent last year. 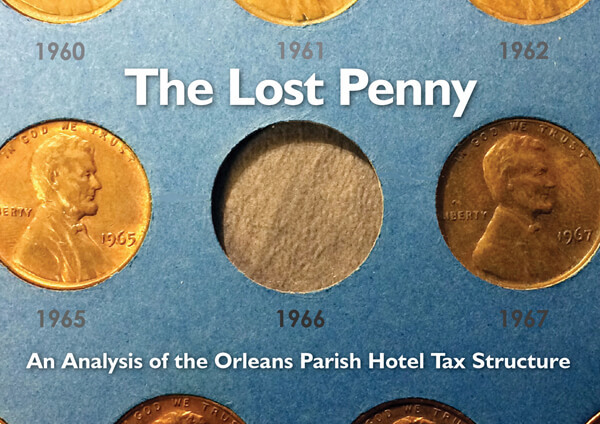 The remaining 0.45 percent could be captured either by shrinking the current state hotel tax rate to make room for New Orleans’ extra share, or by rededicating existing revenue to city coffers, the report said. The latter idea in the report bristled representatives from the stadium district, the convention center and the group New Orleans and Co., formerly called the Convention and Visitors Bureau. The state Stadium District also dismissed any change to the tax revenue structure, arguing it could hurt the bottom line for sports and entertainment complexes like the Superdome and potentially force the district to tap the state’s general fund for support. Also showing opposition was the Convention Center, whose large budget surplus from hotel-tax revenues is a key focus of BGR’s report. Melvin Rodrigue, the Convention Center’s president, disputed that the group’s budget has any “excess revenues,” saying its reserves “may not be technically ‘obligated’” but are kept on deck for “major considerations such as replacing a 40-acre roof.” Rodrigue further defended the Convention Center’s estimated $557 million project to renovate the main facility, widen the adjacent boulevard and build an adjoining hotel — a project BGR has previously criticized. “The (Convention Center) has an unblemished 30-year history of using the taxes entrusted to them wisely and in ways that have been proven to create jobs and generate new tax dollars for both the city and state,” Rodrigue said. As an alternative, Perry pointed to a proposal he announced last monthfor the city to collect 0.55 percent of sales tax on local hotels, mirroring part of BGR’s recommendation. Perry said those revenues could go toward financing about $81.8 million in one-time bonds to pay for drainage and Sewerage & Water Board needs, which rounds out to about $6.75 annually. Perry also challenged BGR’s assessment of the suspended 1 percent tax, describing it as “the single greatest tax exchange between a state and a municipality we have ever seen crafted from a cost benefit analysis.” Perry further said hotel-tax revenues have been key to building and maintaining “the two largest economic drivers in New Orleans” in the Superdome and the Convention Center. Cantrell, for her part, panned that proposal shortly after Perry announced it. On Wednesday, her communications director, Beau Tidwell, said the mayor is “at the table with stakeholders across the board” to reach an agreement for more infrastructure funding. “All options remain on the table to get us to a win-win,” Tidwell said. A spokesperson for Edwards, who has previously opposed shuffling around hotel taxes, said the governor plans to discuss the BGR report with Cantrell, New Orleans legislative delegation and Convention Center board members. Edwards himself, speaking with NOLA.com | The Times-Picayune’s editorial board last week, said he’s holding talks with Cantrell about “some other things that we can help on,” but stood firm on his opposition to tax revenue rededication.